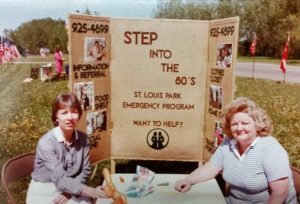 STEP was founded in 1975 with a $3,000 grant from the city of St. Louis Park and a $2,000 donation from the local faith community. As with many nonprofits the first few years of operations were a real struggle. Getting the word out and getting people involved was very challenging. We managed to pull through and now over 40 years later STEP is still offering almost exactly the same services to the community that we did back then. 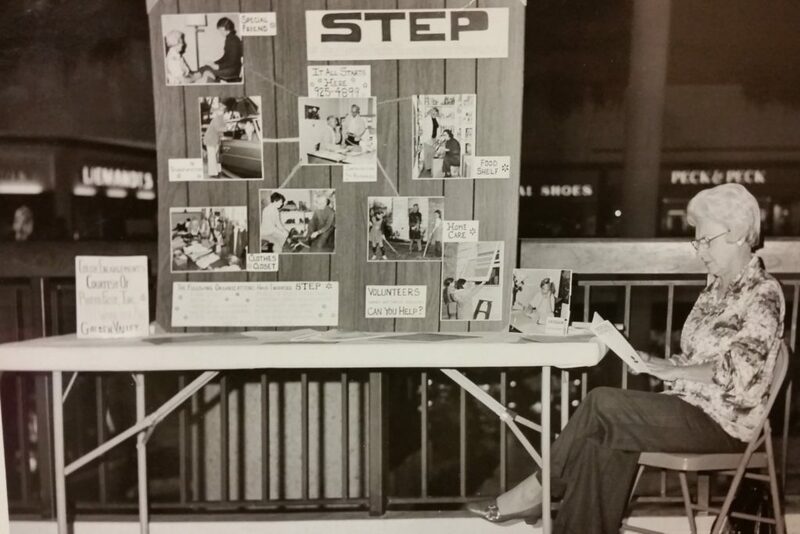 We are very lucky that someone had the foresight to archive hundreds of photos and articles from the beginning of STEP. Below, are just a few of them. Everything STEP has done over the years has been made possible by the thousands of volunteers, many of whom are no longer with us and their names have been lost to time. In these photos we get glimpses of what they did for STEP and St. Louis Park. We know they worked hard and cared deeply. We appreciate all they gave. 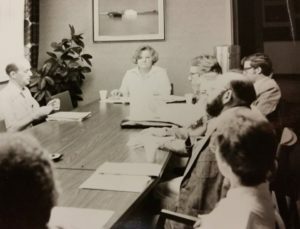 A rare photo from a Board of Directors meeting in 1979 at Park Nicollet Methodist Hospital. Sue Nelson, our first Executive Director can be seen at the head of the table. Sue Nelson, seen here on the right, was the first Executive Director at STEP. Notice the original STEP logo on the sign. STEP/ MnDOT event on August 30, 1978. STEP was granted $8,666 to help fund our Transportation Program. 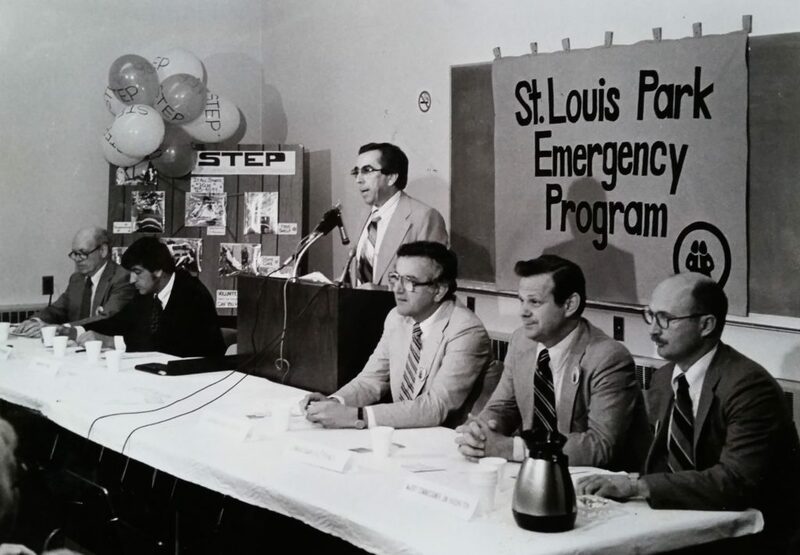 Seen here from the left are: STEP Chairperson Paul Kelsey, Representative Pete Petrafeso, Mayor Irv Stern (speaking), Governor Rudy Perpich, Congressman Bill Frenzel and MnDOT Commissionaer Jim Harrington. STEP booth and volunteer. We can see the “Peck and Peck” store sign in the background from which we can determine this photo was taken at Knollwood Mall between 1981 and 1982. 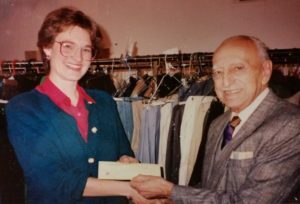 Many of you will remember Peck and Peck was a woman’s fashion retailer. 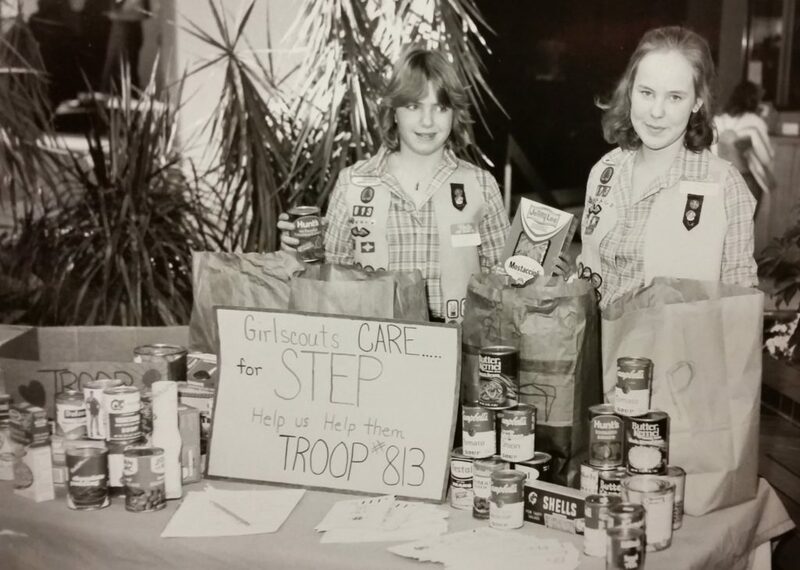 Girl Scout drive to support STEP at Knollwood Mall, March 13, 1982. One of the earliest articles about STEP. Sue Nelson, our first Executive Director, is quoted, “Nearly 300 residents were served last year.” That’s pretty good for an organization as small as STEP was in its second year of operations. These days STEP serves nearly 4,000 people each year! Notice STEP managed to keep the same phone number though multiple moves and over 40 years of operations. 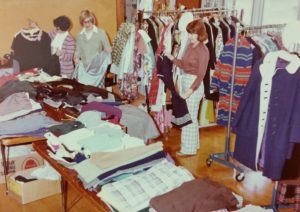 One of the earliest photos of the STEP Clothes Closet. 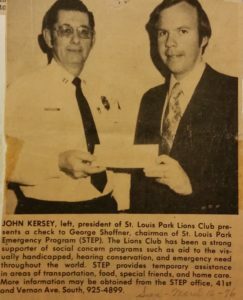 A rare photo of STEP’s first Chairperson of the Board of Directors, George Shoffner (right) and John Kersey of the St Louis Park Lions Club. 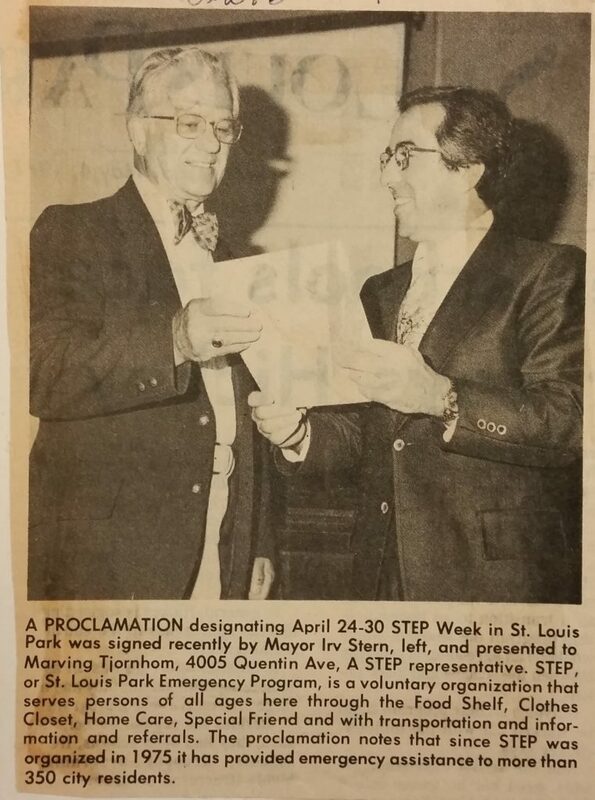 One of STEP’s most active volunteers in the early days, Marving Tjornhom or “Marv” to his friends, is seen here accepting a Proclamation from St. Louis Park Mayor, Irv Stern. Debbie McConnell Okerlund, STEP’s second Executive Director. Debbie served from 1986 until 2000. 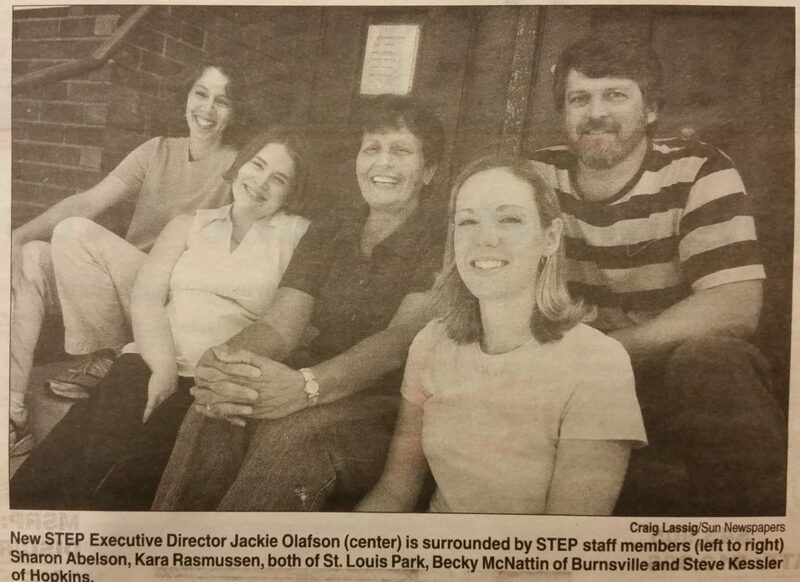 A newspaper photograph including Jackie Olafson (center) and Sharon Segal Abelson (now a STEP board member). Jackie took on the role of Executive Director in 2004 and continued as the well known and loved face of the organization until 2015. To see even more photos like these, about 30 more to be exact, follow this link to the photo album on our Facebook page.